The Alternative Village Fete: A bustling area featuring everything from specially commissioned live art stalls and performance, live music, communal dance, to stalls selling everything from vintage fashion to homemade food and drink. Roving street performers across the site include the Vintage Tea Club ladies, Paul Henri’s Chapeau Magique making extraordinary paper hats and Theatre Hullabaloo’s new show for under-fives weaving together stories old and new. The Multi–Thrifty Swapshop, an all-weekend event featuring everything you might want to exchange from glamour clothing to garden shears, aided by the notorious Charity Shop DJs. Street food stalls galore and food workshops covering everything from home-smoking, pickling, plucking, sushi, sourdough and more. To celebrate the festival, Darlovelo is offering a special weekend bicycle hire service from our mini-hub near the railway station, Cafe Create. 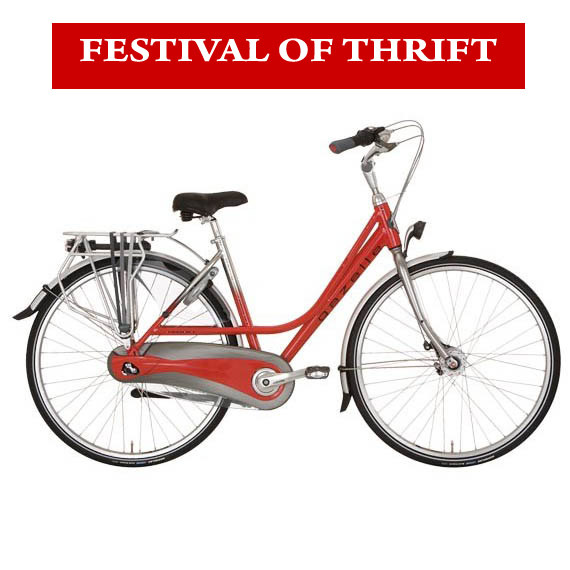 Visitors to the festival can hire a bike for one or two days for the special price of £2 or £3 respectively, by using the form below. Just fill in your details, send a scanned copy of proof of address, for example a utility bill or driving licence, and book and pay for a bike for one or two days. You can collect your bike anytime in the morning between 9:00 and 11:00, and return it between 17:00 and 18:30 at the end of your hire day(s). Bicycles are limited, so you MUST book and pay in advance using this form. Please fill in your details below, attach your proof of address, and click the submit button. Then make your payment using paypal. After submitting your details, please pay below. We’ll confirm that your bicycle is booked and reserved by email. Choose your hire days from the drop down menu. Due to demand over the weekend, we cannot guarantee a particular model. However, you can find more information about our fleet here.